Customize it! I suggest you play with the add-in's and flavor these biscotti bites to your liking like I did. I went with pistachios and orange zest here and the original recipe had the unusual combination of shredded coconut, grapefruit zest, and chopped chocolate. Think almonds, hazelnuts, macadamia nuts, dried fruit, candied ginger...whatever your favorite biscotti combination might be. There are so many possibilities! You could also size these biscotti bites to your liking. I think it works best no bigger than the size I made them (slightly larger than a tablespoon's worth) but you could go smaller if you want to serve them along with other desserts or to a large number of people. We all know everyone loves miniature treats! One bake in the oven for about 20 minutes and the cookies are done. They come out much as they went in. They taste great as is but a little dip in chocolate makes them look and taste all the better. I only needed about 2 ounces of bittersweet chocolate to dip my batch of 18 of these biscotti bites. I used 70% bittersweet chocolate. Since you're essentially not cooking the chocolate, you'll really taste what you use so go with a chocolate you love. I brought out the Scharffen Berger for this; I love the sharp fruity flavor of it. Since I was using chocolate as opposed to a candy melt, I made sure to carefully/gently melt my small amount of chocolate. I put 3/4 of it in a bowl set over a pan of barely simmering water and stirred it until just melted. I took it immediately off the heat and stirred in the rest of the chocolate until smooth. This worked quite well and I did not have an issue with bloom (those gray streaks you often see with untempered chocolate). Once the chocolate sets, you can store them in an airtight container in a cool place. Chocolate is set and ready to be eaten or packed up; these babies are delicious! I served these at a weekend brunch as a little something sweet to end our meal. They were a hit and I'm thrilled to make this cookie discovery. I hope you try it so you'll know what I mean. They were surprisingly buttery and rich, despite having just 3 tablespoons of butter distributed among the 18 cookies. There's a lot of flavor in these bites, and for a chocoholic like me, the thin layer of bittersweet chocolate just wraps it all up beautifully. In a medium-size bowl, whisk the flour, cornmeal, baking powder, and salt together. Place butter into the bowl of a stand mixer fitted with the paddle attachment and beat on medium-speed until smooth. Add sugar and orange zest, and beat until pale and fluffy, about 2-3 minutes. Beat in the egg and vanilla extract until combined. Scrape the sides and bottom of the bowl. Add flour mixture and beat on low speed until just combined. Add pistachios and mix until just distributed. Using a small ice cream scoop (about a tablespoon or so), drop rounds of dough spaced 1-inch apart onto a parchment or silicon-lined baking sheet. Refrigerate for 30 minutes. Preheat oven to 350 degrees. Bake, rotating the sheet halfway, until cookies are golden, about 18-20 minutes. Let cool completely on baking sheet set on a wire rack. For the chocolate dip, set chocolate over a bowl of barely simmering water and stir until chocolate is just melted (to avoid over-heating the chocolate which could create bloom or gray streaks in the coating later, I melt 3/4 of the chocolate, remove it from the heat and stir in the rest until just smooth). Transfer the melted chocolate into a small bowl. Dip the bottoms of each cooled cookie in the chocolate, lightly scraping off the excess against the rim of the bowl (you want just a thin layer). Set cookies on a parchment-lined baking sheet. Refrigerate for about 30 minutes until chocolate is set. Once set, you can place cookies into an airtight container in a cool spot. Thanks, Karla! You can never have too many cookies/cookie recipes. : ) I really loved these little surprises. You can really add whatever flavors you enjoy. 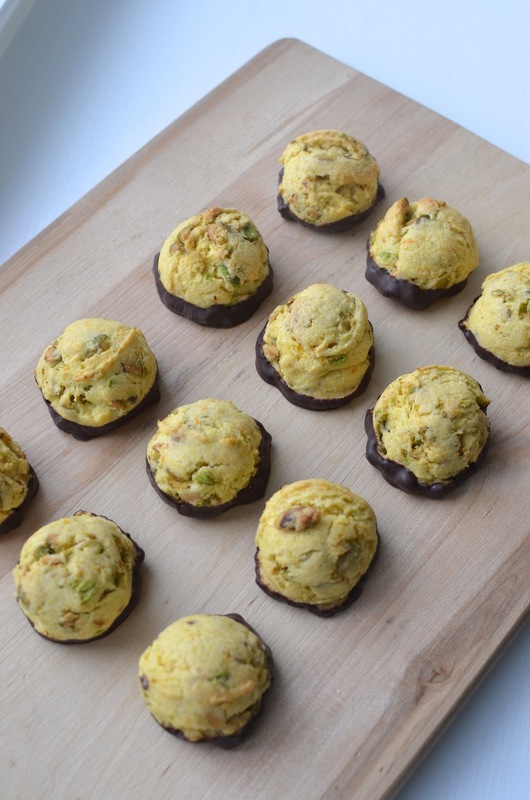 I don't think I've ever baked something with orange and pistachio, but I think the combination sounds wonderful. These biscotti sound great! I love making this combination of flavor in biscotti and now I can do it in this one-bake form. Citrus zest goes so well in all kinds of baked goods! Have a great week! The cornmeal was a great contribution in these cookies. It's not even that they needed it but it gave it a lot of interest. I did find myself going for the chocolate bits first...typical me! You enjoy the week! Hope there's no more snow!! 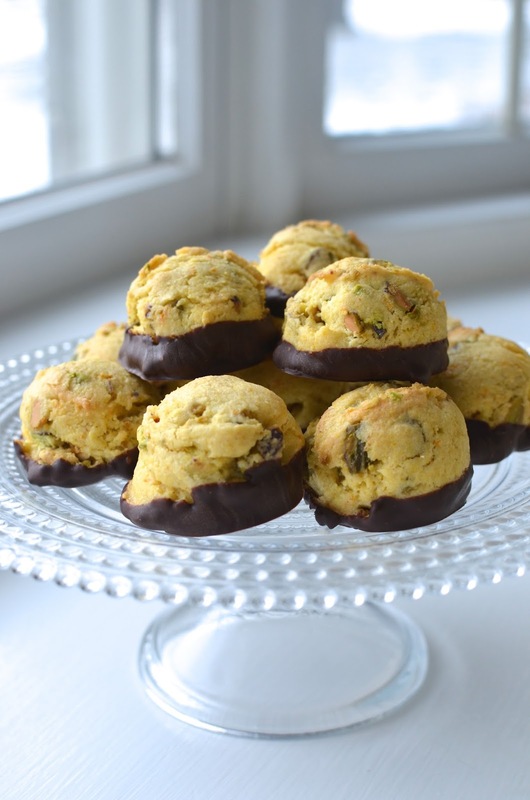 Love the idea of a biscotti bites already, but these are made even better with that chocolate! You can't never go wrong with chocolate and pistachio. We would love these biscotti bites too. You're telling me! haha. Thanks! I have never seen round biscotti, but I love this idea! And these get bonus points for being dipped in chocolate! Looks like another winning recipe! A first for me, too, Eva. This recipe is a keeper! Keeps well and easier than traditional biscotti. Both are so good but it's fun to do something a little different sometimes. Thank you! I love that they are in cookie form!! And the flavors - perfect. These are so creative!! I've never made biscotti before, but I imagine they would be much easier to only bake them once :) I love the pistachio and orange combo! So glad you share my feeling on these, Ashley! : ) I love biscotti...just great to make some and keep them around when you want a little something sweet with a cup of tea or coffee. These are really tasty so I hope you try it and put your own favorite flavors in there. Coffee and a couple of biscotti cookies should make a perfectly acceptable breakfast, Lorraine. ; ) Thanks. This is such a great idea, Monica! I love biscotti and making them in cookie form sounds perfect and much easier! I can't wait to try this. They look so pretty and I love the orange and pistachio combo! These biscotti bites look so good! I love pistachio flavors and these look like they would go so well with a nice cup of tea (my fav!). Sometimes I forget how good pistachios are...they don't just look good! I love anything that goes well with a cup of tea, too. Stay warm and get ready for this snow (by that, I mean make sure you have plenty of cookies and hot drinks!). I've never made biscotti because I get turned off by the double baking haha so I can definitely get behind this! And lately I've been obsessed with orange flavored sweets! Monica, one of the reason that I have never made biscotti, is the long baking process...now I sure can handle these bite size biscotti...and the flavors here are just amazing...pistachio and orange...yum! Thanks, Juliana. This is a fun and easy recipe and these cookies are very similar to biscotti w/o the extra work. Have a good one! OMGosh, you had me right here: does not need to be twice-baked, and in round, bite-size form. Love, love, love this. So pinned, and I'm making them too! Hope you try it...it's really easy to make and definitely tasty! That's one of my favourite combos..citrus and pistachio! I actually made muffins of that combo this morning. But these biscotti bites...OMG...these look and sound too good! Everything is just perfect about them! I rarely make biscotti because of the whole twice-baked thing...but these are the perfect way around that! The chocolate-dipped bottoms make them even more fun. The chocolate definitely makes them fun and a little extra tasty, in my book. Thanks! I love biscotti and you made these bites, so fancy. I am going to print and make it for sure. The cornmeal sounds good in it Monica. I can imagine how good it must taste especially with the orange..they are like match made in heaven. Adorable.